The brewing traditions of two great beer nations have come together as Bohem Brewery launches its first collaboration, brewed in partnership with Cornwall-based St Austell Brewery. 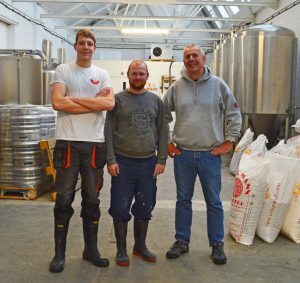 The collaboration brewing day in January saw Roger transport the yeast used to brew St Austell Brewery’s Korev lager to Bohem in London. The recipe, originally developed for a one-off beer called Korev Brut, was given a new twist by being brewed by Roger and Petr on Bohem’s specialist decoction* brewing kit. The result is Otakar Brut Lager, a 6.4% ABV beer authentically lagered at low temperature for six weeks, and regally named for the several King Otakars who ruled Bohemia, which is today within the Czech Republic. The beer is made with Pilsner, Cara Gold, Acid Malt and maize, along with Magnum, Hersbrucker and Saaz hops, as well as Nelson Sauvin for dry hopping. With a fresh, vibrant aroma, and initial light citrus tones of lemon and grapefruit, Otakar has low hop bitterness, which combined with the soft carbonation delivers an easy drinking beer that belies its strength. *Decoction brewing is a traditional European brewing style which sees part of the mash boiled and returned to the main mash to raise the temperature. The process adds the depth, complexity and flavour which characterises authentic Czech lagers. The strictly limited single run beer will be available on keg in selected London bars including the Bohem Brewery Taproom in London N22, and in selected St Austell Brewery pubs. A small quantity will also be canned and sold through the Bohem online shop at www.bohembrewery.com/online-store/.